It has been so long since I posted a review of anything I figured I'd get back in to blogging with something easy - a write up of some of the flashlights that I use. So I took one of each type (or multiple if needed for illustration), piled them on the kitchen floor and took a picture. Disaster struck! Something happened with Blogger and my entire post was blanked out! I didn't hit 'delete' or anything, I was just adding a link to some text and then everything disappeared and the auto-save immediately saved the empty version. So reviews for A-E are going to be really short, I don't have the patience to rewrite everything. A) Stanley 3-in-1 Tripod . AA. LED. The newer design of 'B'. It takes 2x AA in each section (so 6 total). When all sections are connected to the main housing they can turn on/off together. Has a tripod mode with isn't very useful since the heads tilt in separate directions. Each of the three heads actually has its own thin handle (the black part of the main body) so you can separate them. So instead of having one bulky overweight lower powered flashlight, you can have three even more poorly shaped underpowered flashlights. These are on the chopping block - will be donated to charity next time we have a critical mass of items. Not recommended. Dim lights, junk plastic, useless tilt head feature. B) Stanley Maxlife 369 . AA. LED. The older, superior version. It takes 3x AA in each leg. With all the batteries in one leg charged you can use the light, the extra batteries make it last longer, but the brightness stays the same. The tripod and tilt-head feature work well. Unfortunately the LED is not really that bright. If you are using when it is light out already (working under a car in the sun, etc) you can hardly tell it is on. Standard Stanley plastic quality - so it should last awhile if you don't really use it, but once you start using it don't expect it to last long! Not recommended. Not bright enough, legs or head hinge are likely to break. If you want an adjustable flashlight I'd suggest a Jobi. C) Coleman Pack-Away . D. Krypton. A collapsable camp-site lantern powered by 4x D batteries. It is heavy but makes a pretty good camp table light. Built-in handle allows it to be hung from a hook or branch pretty easily to help illuminate your table. I have a number of these at home for use in power failures for general-purpose room illumination. Weight is the biggest problem - the light isn't lite by itselfand adding 4x D batteries doesn't help. It does give decent 360 illumination for 12 hours though. Recommended for home power failure situations or taking 1 or 2 'car camping.' Too heavy, too bulky for any camping involving hiking. 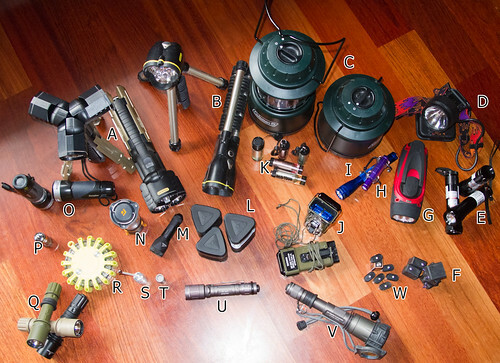 D) Petzl Headlamp . AA. Incandescent. No idea why I still have my old incandescent headlamp. I would not suggest one of these to anyone nowadays, but when I got it (pre-LED) it was great. Now you can get ones that are much more comfortable, with smaller lamps and lighter battery packs. I recommend a modern Petzl LED-based headlamp, but not this old one. E) Home Depot Specials. AA. LED and Laser. Inexpensive metal flashlights from a Home Depot aisle end cap. Bought for the laser pointer feature. Very bright laser compared to the small 'watch battery / keychain style' ones we'd been using with the cats. The light is nothing to write about, it is a light, it shines. The laser pointer is very fun for the cats, and unlike the cheap keychain ones the switch is clicky (on/off instead of momentary) and the laser doesn't wash out in the sun.